Yes! 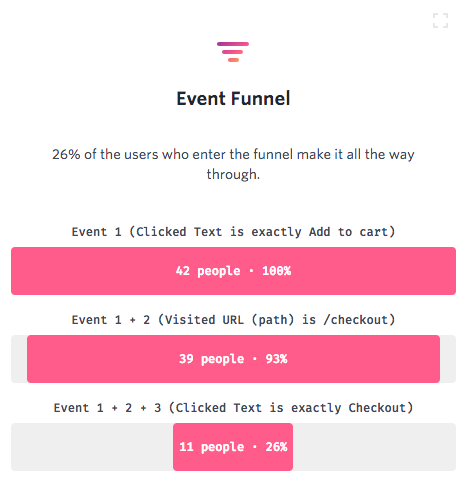 Event Funnels are one of several different kinds of Searchies. How do I create an Event Funnel Searchie? To create an Event Funnel Searchie, you must first start a search with the events you'd like to monitor. FullStory will create a Searchie with a funnel when your segment contains two or more event queries. Then FullStory will show you the percentage of your users who have been in this funnel during the specified time frame. If you're curious about why your customers are falling out of the funnel at certain steps, start by clicking on one of the bars in your Searchie to instantly alter your search to the first step. Clicking on the bar titled "Event 1 + Event 2," for example, will automatically show you customers who completed those two steps, with no reference to Event 3. This Searchie results in any customer sessions that clicked the text Add to Cart and Visted URL (path) "/checkout". Next, you can compare how many customers added to their carts, but didn't complete their purchases by clicking Checkout. To see which customers were affected, you can change the third event filter to Has Not. This will capture all customers that added to their carts, went to the checkout page, but didn't complete checkout. Of course, this technique is up to you to alter to suit your application! You'll narrow down the search to exactly where in the buying process customers are dropping off. Now, by watching a handful of sessions, you can see for yourself where customers get tripped up or lose interest and leave your funnel.